Perusing a portion of my vinyl LP collection the other day, I noticed how many of them bore the tell-tale mark of the cut-out bin. (A cut-out was a record deleted from a company’s catalogue, either because the record failed to sell, or did not sell a requisite number of copies within a specified period of time.) Some have a hole in the cover (some clearly punched through, some done with what seems to have been a screwdriver, tearing the cover unnecessarily), and some have a cut corner. I suppose that’s one activity I miss from the old vinyl record store days, perusing the cut-out bins, searching for a bargain and occasionally finding a great record in the process. But in addition to the cut-out bin, there was the import bin; I frequented both places. As one might imagine, the records in the import bin were normally priced a bit higher than domestic LPs, but the imports were always worth checking out, and many titles were only available there. My vinyl LP copy of King Crimson’s Earthbound, for instance, bears the cover sticker marking it a “Jem Records Import,” as does my copy of The Young Persons’ Guide to King Crimson. One band that seemed to dwell nowhere else but in those two places—the cut-out bins and the import bins—was Nektar (ancient Greek spelling of nectar). I came across these albums the other day, and I noticed that I had purchased every single one of them as a cut-out. Not that I have a complete collection of the band’s albums. I have only a few of the albums that were issued domestically by Passport—A Tab in the Ocean (1972), Remember the Future (1973), Recycled (1975), and my favorite, Down to Earth (1974). 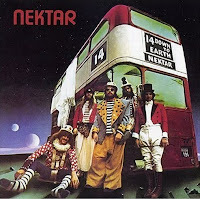 Nektar was composed of five Britons who played psychedelic-tinged progressive rock à la Hawkwind or Gentle Giant. Their first records were issued by the German Bellaphon label, which is why the band’s records could be found in the import bins. Not nearly as popular as progressive bands such as Genesis or Yes, as I mentioned above I never found any of Nektar’s albums issued by Passport anywhere but in the cut-out bins. I know Nektar maintains a small cult following, largely (I’m speculating) because of Roye Albrighton’s hot guitar playing. I first heard them on FM radio as a consequence of the local DJ’s fondness for Remember the Future (1973), or at least, one side of that album. Remember the Future is a concept album that only a group of spacey hippies could produce, and is so profoundly corny, so painfully silly, and so woefully déclassé that I find it impossible to write about seriously. It’s about an extraterrestrial bluebird that allows a blind boy to see the future. The only reason this sort of hokum (however sincerely meant) has never been parodied is because the band’s records never existed anywhere but in the bargain basement, and therefore wasn’t a big enough target for a parody. Lest I seem too harsh, however, I will say that I’ve always had a special fondness for Down to Earth (1974), although Recycled (1975) is very good as well. Down to Earth is a sort of loose concept album, in which the band’s music is presented in the context of a circus, with Hawkwind’s Robert Calvert acting as the “ringmaster.” Rather than sprawling jams (or Remember the Future’s single composition spread over the LP’s two sides), the band tried its hand at shorter, more melodic compositions, eschewing the bombast of previous albums, and created a minor classic of “space rock”—“Astral Man” is the album’s first track, followed by equally catchy tunes such as “Nelly the Elephant,” “That’s Life,” “Fidgety Queen,” “Oh Willy,” and perhaps the album’s finest track, “Show Me the Way,” which in 1974-75 received a good deal of airplay on FM radio. It seems to me that to understand the way Nektar’s cult reputation developed is to understand the way the way economics shapes the patterns of consumption of popular music. Nektar’s cult reputation revealed the market that existed in parallel to the mainstream commercial market, and it may be that its existence is what allowed the mainstream market to flourish—spurring it to be more imaginative and productive.